One thing I miss about being in college is being surrounded by all my friends. I used to bake once a week and between all my neighbors, my roommates, and boyfriend, the food didn't last long. Now when I bake my desserts, they sit on my counter all week begging me to eat them. The solution I've come up with is not making things very often. One thing that never lasted more than an hour in my house last year was a Chocolate Chip Skillet Cookie. It was my roommate Whitney's speciality. 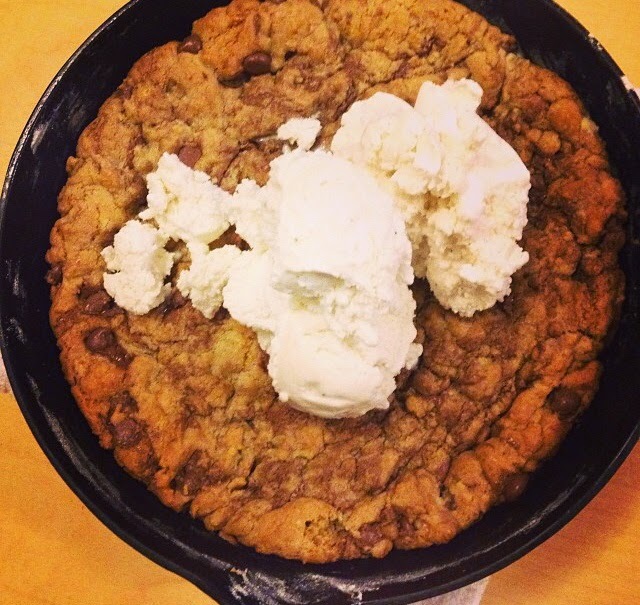 All six of us would hover around the gargantuan, warm cookie (with a scoop of ice cream on top) and dig in. I haven't gone trick or treating in years, but this recipe from Spice Jar looks like the best way to combine that leftover Halloween candy you have into a yummy dessert that probably won't last long. Labels: candy, cookie, halloween, leftovers.